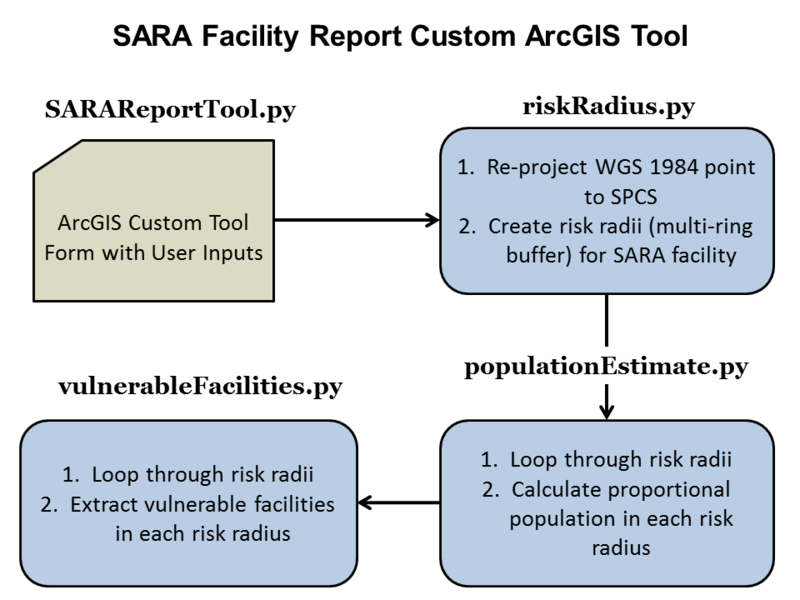 The SARA Risk Radius Analysis Tool is a custom ArcGIS tool developed to assist the Cumberland County Public Safety department in their SARA Tier II reporting. The tool performs a series of analyses on sites with certain quantities of hazardous chemicals. The results of the analysis go into a plan for each site. The user enters in the latitude and longitude for the site, a unique ID for the site, the distances for the risk radii, the units for the risk radii, and a folder location for output files. SARAReportTool.py obtains the user inputs from the tool’s dialog window, and imports functions from the other three scripts. riskRadius.py converts a latitude and longitude coordinate pair from the WGS 1984 geographic coordinate system into a projected coordinate system, and creates the risk radii (multi-ring buffers). populationEstimate.py loops through each risk radius and calculates the proportional population in each risk radius using U.S. Census block data. vulnerableFacilities.py loops through each risk radius and selects any vulnerable facilities within each radius. The selected vulnerable facilities are exported to a Microsoft Excel file.